Everyone loves finding bargains, and those of us who sew are no exception. Check out these tips and pointers on where you can get the best deal the next time you need supplies for whatever projects you're working on. It may very well be that you have no space for another sewing machine, or you don't know if the machine even works, but look a little deeper. Does that machine have presser feet with it? Do you have all of the feet that are there? 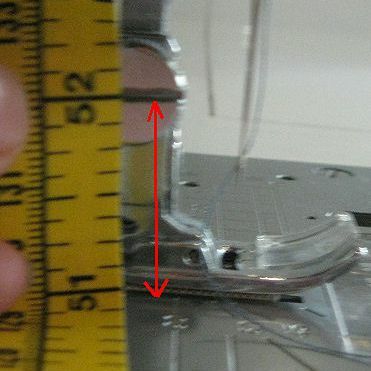 Is it the correct shank for the sewing machine you use all the time? Sew a Sewing Machine Accessory Organizer: A great place to keep presser feet! Shop at Goodwill. Goodwill Industries also has an extensive selection of sewing machines online; many antiques are also available under "Crafts and Hobbies". Many sales will have curtains and table clothes in piles. Just because that "fabric has been "earmarked" as a curtain or tablecloth does not mean it has to spend the rest of it's useful life as such! Think of it as a good sized piece of fabric, that may very well have been preshrunk already, so you can visualize that "fabric" as a dress, skirt, chair cushion cover or anything you can imagine! Don't be surprised if you find boxes full of fabric at bargain prices too! Many times when homes are cleaned out, no one in the family wants the fabric that "grandma" treasured because no one else sews. You sew and you can find something to do with that fabric. Vintage patterns are so popular that pattern companies routinely bring back patterns from the past. Yard and tag sales are great places to find vintage patterns! It's not unusual for boxes of patterns to be found. Even if facing pieces are missing, you can make a facing pattern piece. You may even find your favorite pattern that you lost years ago. This time, preserve the pattern and you'll have it forever. Compare the price of new patterns and the bargain you are finding to decide if it's something you want to haul home... you can always donate the patterns if you aren't going to use them. Looking For Places to Donate or Sell Your Old Sewing Patterns? Choosing Thread Color: Color, Types of Thread, and Fibers Count. Identifying Fabric: What Kind of Material Is It?